Rarely do I get as excited about gear as I am about Jetboil's PCS (Personal Cooking System) canister stove. Truly, the PCS is revolutionary. Yes, the Jetboil's 15-ounce spec weight is potentially-alarming compared to 2.5 ounce stoves like Snow Peak's GigaPower or Coleman's F1 ultralight. That weight discrepancy is a bit misleading, however. Unlike traditional canister stoves, which are really just burner heads, the Jetboil PCS gives you everything you need to cook and eat your meal (except a spork). The Jetboil includes an integrated cook pot with lid which doubles as an insulated mug, plus a bottom cap which doubles as a measuring cup. Factor in the weight of a cook pot and mug, and the Jetboil suddenly compares quite nicely to an ultralight stove. The big difference, however, is performance. I don't know that I can adequately convey how quickly and how efficiently the Jetboil PCS boils water. Put a cup of water in the pot, hit the auto-igniter button, and get ready: you've won't have long to wait until you've got boiling water. Cooking in-the-field at dinner time, my hiking partner was repeatedly amazed how much faster my Jetboil delivered boiling water than his stove. Heck, I was amazed as well. Speed in this case translates directly into fuel efficiency. 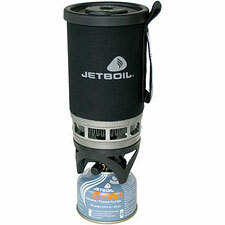 Jetboil says the PCS stove will boil twelve liters of water on one Jetboil microcanister. My experience absolutely bore this claim out—I used less than one 100 gram fuel can (the small size) on my five day Pacific Crest Trail hike. That included cooking breakfast and dinner, plus a lot of tea. The Jetboil's sheltered design mitigates the usual annoyances when it comes to cooking outdoors with a canister stove. A little breeze won't bother the stove at all, and even a modestly sheltered area is all you need to cook in windy conditions—if that. Once again, this translates directly into improved fuel efficiency. So, add in the cost and weight of extra fuel cans when totaling up the Jetboil's ounces. If you partner up and share a stove, the Jetboil is a no-brainer compared to a traditional canister stove. Weight-wise, you'll only enjoy an advantage with compact canister stoves on very short trips in good weather. For anything else, I suspect you'll come out ahead with the Jetboil. For performance in cold, wintry weather, Jetboil has upgraded the PCS to the more-expensive Sol Ti, which also happens to be much lighter, so do consider the Sol model if you're a winter camper, or if you want a significantly lighter stove. When you're done cooking, the Jetboil stove plus one can of fuel fold up into itself, creating a tidy package about the size of a 1-liter water bottle. This fits nicely in your backpack, unlike the usual assortment of cookware. Like most people, I'd heard stories about the fantastic performance of the Jetboil system, but I wasn't moved to try one myself until I saw it in action (my guide brought one along on our North Palisade climb). I'm sorry I waited so long. This is one fantastic little stove.